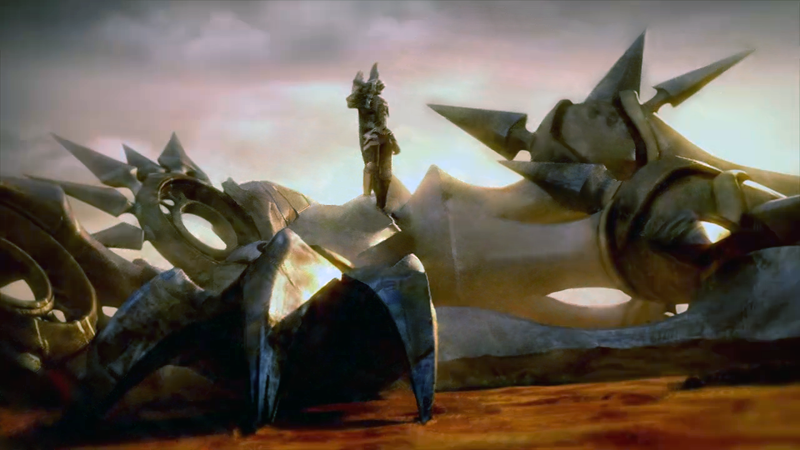 As you all know, the Secret Ending #1 of Kingdom Hearts 2 called "The Gathering" shows Terra standing above a defeated enemy, then the enemy vanishes in sand through the air. Until today its form has not yet been revealed, I assume this was a preliminary or discarded version because I compared the full list of heartless, nobodies and unversed, and even making a mix, none fits (like the Xemnas King or Xemnas Centaur). I spent around 12 hours to clean the frame in the best way I could, and I share the result if someone want to keep the image in original quality or discuss about it. Maybe one day somebody will ask Nomura in an interview about all the concepts or artworks discarded from the games. It's hard to discuss something that never made it past the concept stage. Especially something that has no information that has been released on it. It could be anything. Vanitas' true form. Xion. The first Heartless/Nobody. A boss fight. Anything. It's hard to discuss something that never made it past the concept stage. Especially something that has no information has been released on it. It could be anything. Vanitas' true form. Xion. The first Heartless/Nobody. A boss fight. Anything. Yeah and we probably have a few hacks like the Jungle Book in BBS, Honest John and Gideon (the fox and cat from Pinnochio) in Days, the ship from Treasure Planet deleted from DDD along with deleted concept art.